KOSCIUSZKO BUSINESS POINT - is located in the very heart of Torun, very close to Torun’s old town which makes it possible to take advantage of the rich selection of services offered there. 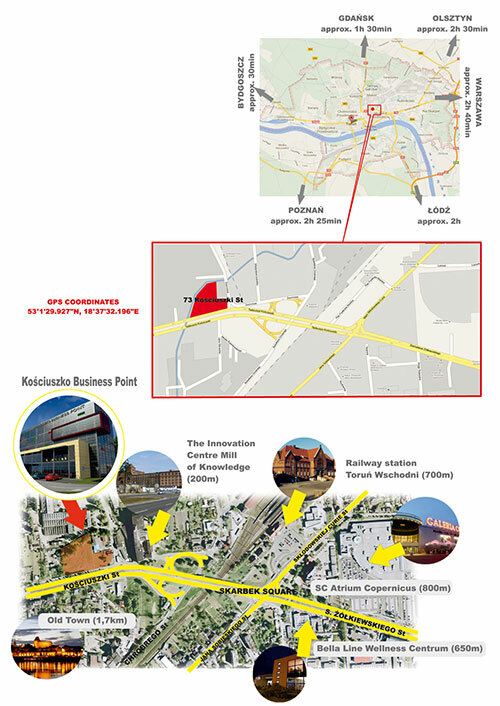 In the area one can find the developing The Innovation Centre Mill of Knowledge together with the business incubator in the "Torun Mills", the developing Copernicus Shopping Centre, Centrum Fitness, access to public transportation (buses and trams) and rail (West Station) together with the fast developing Toruń – Bydgoszcz railroad. A preschool and schools are located within 500 m of the real-estate. The very building will have restaurants, service points (i.e. a bank), cafes, a gym, etc. Due to its location in the city centre the building will be accessible by cars through a convenient ramp and drive-in on Kosciuszki Street use of which will be made easier by traffic lights. There are accessible tram and bus lines within 200 m of the building. Rail lines are located within 500 m of the real-estate.